Google has introduced “Me on the web”, an online reputation management tool that allows you to manage search results for your name. While its first iteration is fairly basic, it’s a game-changer for the burgeoning industry that has sprung up around online reputation management software – and a death knell for most of the hundreds of companies now in the field. The new dashboard lets you set up alerts for mentions of your name and email addresses, as well as links and other data included in your Google Profile. You could establish these alerts before, but the new dashboard makes it an easier process. “Me on the web” also gives you links to resources for removing content about you from search results. 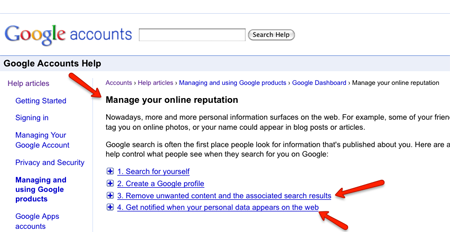 To begin using Google’s new reputation management tool, you’ll need to set up a Google Profile. Here’s mine.